Happy Harriet Carter Wednesday! As new people are making their way to ImBringingBloggingBack on a regular basis I still get the question of “What is Harriet Carter?” So, let’s quickly recap. The Harriet Carter catalog has been around since 1958 and sells the most tacky crap ever. This catalog would somehow mysteriously end up at my house when me and my sister were little and we used to die-laughing over the stuff they sold. Fast forward many years and Harriet is still around and kicking so I choose a few products to highlight each Wednesday….thus, “Happy Harriet Carter Wednesday!” Let’s role! Product # 1 – Are you tired of shoveling this winter? Do you ever wish that you could just “wheel” the snow away? Well now you can thanks to Harriet Carter! Seriously? Really? Yeah. Has Harriet never shoveled before? Look at this thing. It’s sorta like a plow attached to cheap metal on top of two rubber wheels. This guy is pushing it with one hand. I wish there was a live demonstration. There is no way this thing could work. I bet it doesn’t even move in the snow, let alone “push” the snow out of the way. However, this probably would work if instead of “snow” on the ground there were just “bubbles” on the ground. That thing can definitely easily move bubbles out of the way, but not snow. No way. Actually, let me correct that. Like the picture, I bet this contraption can move “cartoon snow” out of the way as well. Thanks Harriet for increasing the chances that this guy goes into cardiac arrest. See you in court! 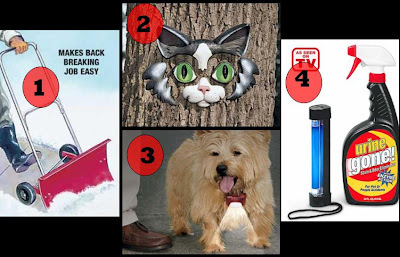 Product # 2 – Have you been outside and wished that your tree looked like an animal? How ’bout a cat? Sure! I mean, who hasn’t. I always wish that my trees had faces and looked like other things. Seriously, is Harriet Carter on LSD? Please at least tell me she dabbles with crystal meth! Why, why would you ever need your tree to have a cat face? What’s the point? Are people supposed to walk by it and say, “Oh my God look at that ‘cat face’ in that tree! That’s amazing and so funny all at the same time!” How come the tree can’t just look like a tree? That’s like putting a “tree” on Harriet’s face. How would she like it? Wait a minute…I have an idea. I have to go. Product # 3 – Speaking of animals….is your dog so stupid that it can’t see where it’s going? Does it ever ask you (bark) for a flashlight as it goes around the neighborhood? Yeah, I didn’t think so, but you’re going to buy him one anyway aren’t you? For me, this is even worse than dressing up your dog in human clothing. Aren’t dogs supposed to have an amazing sense of sight and smell? Or is your dog so lazy that it needs a light? Yeah, good luck letting your dog out by himself in the neighborhood. There’s no way that “Sparky” isn’t going to get his tail kicked with this flashlight necklace. I mean, even look at where the light is pointing. It’s pointing straight down. It doesn’t even light the away ahead of you, just below you. Useless. Turn off that flashlight necklace. Take it off your dog. Hit yourself in the face with it. Repeat as necessary. There are homeless people living on the street and you just wasted your money on this. Awesome. Product # 4 – Ahhhh, I heart “As Seen on TV.” I can’t blame Harriet for this one alone, but since she does sell it she is fair game. Introducing “Urine Gone!” As the label says, “For pet or people accidents.” All you need to do is spray this on the urine stain and it will disappear. Seriously, if you have this problem in your house please don’t EVER invite me to your house. Ever. I know exactly the kind of person you are. You’re the type that has 5 cats, makes brownies and brings them into work. As I take my first bite you tell me how you let your car lick the egg-beater. Your cat is disgusting and you are even more gross. I bet your house is soaked in urine. And “people accidents?” What’s going on in your home that you have human urine stains all throughout the house. Did you know you have a toilet? Just use that. No stains. This makes me so insane. I almost want to lurk in a Walgreen’s, wait for someone to purchase this product, follow them to their home, and call the board of health and have their house boarded up. Oh, and thanks for the “black-light” Harriet! Let’s realllly expose those urine stains. You are a filthy, filthy woman. Well, that concludes another segment of “Happy Harriet Carter Wednesday!” No go and scrub those urine stains out of your sofa you gross pigs!